The BCI PK6137A three-axle 13.7-metre coach is continuing to find buyers in Australia with operators who prefer an American driveline. The chassis on the BCI PK6137A is made by BCI, incorporating ZF axles made in Germany. Recently ABC spent some time with BCI's authorized distributor, Bus and Coach Sales Australia at their brand new purpose built facility at Yatala located between Brisbane and the Gold Coast to test-drive the BCI PK6137A. 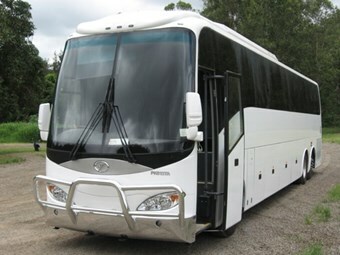 This coach like all BCI products was built with Australian-supplied Galvanized steel to the full 5-star spec with 56 ADR 68 recliners, toilet, curtains, Carrier Avantac air-conditioner and heated electric mirrors. The chassis under this coach is BCI's own Australian design utilizing ZF axles from Germany incorporating Independent suspension to front disc brakes on all axles and the option of a steerable tag axle. BCI have got one good-looking coach here with a very well-finished interior that is comparable to most of the local body builders. On arrival at Bus and Coach Sales Australia we were met by their Sales Manager John Hurley and shown around the new facility and some other buses that were there. Leaving the factory we headed for a run through the Gold Coast hinterland, traveling through some lovely country and over varying road conditions that included smaller back roads and highways. There are some good hills through here and the coach just handled them as if they were not there. I was surprised at the way the coach handled, there was next to no body roll even when thrown into corners and as for the ride, this was very smooth even on some of the rough patches. On one of the longer hill climbs we were lucky if we had to drop one or two gears, it just powered up the hill. The turning circle was also good for a 13.7metre coach, making the coach exceptionally maneuverable. Getting into the coach is via three steps to the driver's area, ground to first 400mm, first to second 210mm, second to third 210mm, third to driver's area 210mm, and then two to the saloon, 210mm and 240mm. For the passengers the 56 recliners, which are fitted with seatbelts, are covered in leather and are very comfortable with good legroom, there are three LCD screens so that all passengers can see a screen; the sound system includes radio, CD, PA and DVD. The driver's area is well set out with a neat dash where all the important gauges and warning lights are in easy sight, all the most frequently used switches fall easy to hand. On the fully adjustable steering column are two stalks, the left operates indicators, hazard lights and headlights, and the right operates wipers and the three-stage retarder. Driving the coach was very good experience. The Grammer fully adjustable air suspended driver's seat was comfortable and very little effort was required to drive, the steering was light but positive acceleration was good and the coach had no problem in keeping up with the traffic, 100km/h at 1200rpm in top gear. The heart of the coach is a powerful CAT C13, 13litre six-cylinder turbocharged diesel engine developing 321kW(430hp) at 2100rpm and producing a massive 2237Nm of torque at 1200rpm and has an engine brake included as standard. To meet Euro 4 Cat use a system called ACERT Technology, which uses no additives like AdBlue. ACERT Technology starts with a very efficient combustion process augmented by cool, clean air. An efficient air system improves fuel consumption and lowers in-cylinder combustion temperatures, which reduces emissions. What is not cleaned up during that process flows out the exhaust system, where the tailored aftertreatment changes the particulate matter into carbon dioxide and water, all resulting in an efficient combustion with low emissions and very good fuel economy. The after-treatment consists of a substrate material core that provides the foundation for the wash coat or catalyst, a substance that is used to speed up a chemical reaction. Hydrocarbons in the exhaust are passed through the catalyst and are chemically oxidised or converted to carbon dioxide or water. You also have an option of a Cummins ISM Euro IV engine rated at 420hp; again no Ad Blue is required. The C13 was coupled to an Eaton Fuller 10 speed UltraShift automated transmission with no clutch pedal. Gear ratios are 1st 10.96, 2nd 8.18, 3rd 6.09, 4th 4.46, 5th 3.32, 6th 2.46, 7th 1.83, 8th 1.36, 9th 1.00, and 10th 0.74, reverse high 2.52 and reverse low 11.23. The Eaton Fuller UltraShift transmission offers the simplicity and reliability of a manual with the convenience of an automatic. This transmission can also be driven in manual mode to allow the driver to initiate and control shifts for flexibility during changing conditions or hold a gear as appropriate. Low mode boosts the rpm point at which downshifts occur to maximize engine braking. Gear selection is from a push button pad or a T-bar type selector; the coach in question was fitted with the T-bar selector. A 750lt aluminium one piece fuel tank is provided and is mounted behind the front axle with fill points on both side of the coach. The full air suspension provides a smooth comfortable ride with next to no body roll a raise and kneel system is also fitted.The air system piping and electrical harnesses are colour coded to assist in any maintenance issues that may arise with the added bonus of the Electrical harness having the addition of being numbered. Luggage capacity is fantastic with huge thru bins with three doors either side making loading and unloading easy. Access to mechanical components is very good with all aluminium lower side panels being hinged; this can also make the fitting of snow chains so much easier. The axles under the coach are ZF RL85E independent front with a capacity of 8,500kg; ZF A132 low noise hypoid with a ratio of 3.54 and a capacity of 12,000kg and the tag is a ZF RL85 beam axle with a capacity of 8,500kg. Brakes are a dual circuit air system with ABS and disc brakes on all three axles. In summing I would have to say that this coach was a pleasure to drive heaps of power, car like handling and quiet, this will make a fantastic touring coach. It is a real driver-friendly vehicle, which should be looked at for those operators that like their American running gear, European styling with an Australian influence. Many thanks to John Hurley of Bus and Coach Sales Australia for allowing ABC access to this coach.